Aster Cape Town, also known as September Flowers, is a Pink cut flower. Approx. 80cm and wholesaled in Batches of 25 stems. Aster, (otherwise known as September Flower), is a genus of the Asteraceae family. The name 'aster' is derived from the ancient Greek word meaning 'star' because of it's star shaped flower heads. 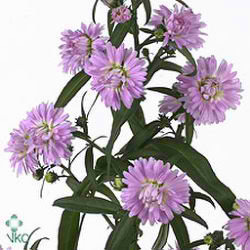 Aster is a multi-headed flower used as a filler in the floristry trade. It also has the effect of adding softness to flower bouquets, arrangements and wedding flowers, (similar to gypsophilia). Aster is also popular in wedding flowers that require a cottage garden / vintage feel.